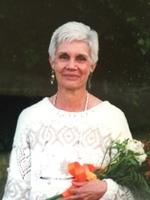 Provide comfort for the family of Jane Bonnell with a meaningful gesture of sympathy. Peacefully Wednesday March 6th , in Almonte General Hospital, with cherished friends and her dear son Michael at her side. Jane Bonnell, painter, designer, mentor, enjoyed a variety of locales and experiences, including a penultimate 20 years painting the landscape west of Algonquin Park. She loved books, art, music, people and cats, and felt especially fortunate to have been so rich in friends. Thanks to the Almonte Hospital staff and the wonderful care of the ladies of The Mills Assisted Living. We encourage you to share your most beloved memories of Jane here, so that the family and other loved ones can always see it. You can upload cherished photographs, or share your favorite stories, and can even comment on those shared by others. Provide comfort for the family of Jane Bonnell by sending flowers. John and Irene Roth We are sorry to hear of Jane's passing. For many years, she was central to the Almaguin Arts community and, like many of her patrons, we continue to enjoy her effusive paintings on our walls. Jane was a unique and classy woman who has been greatly missed since she left the Almaguin community. We were fortunate to enjoy her friendship and stimulating conversation. We just heard about Jane's death yesterday. We have fond memories of time spent with Jane in Sundridge; conversations were always interesting. Condolences to Mike and his family, and to all other family members and friends. A very lovely lady. She will be missed. Thinking of you and your family at this time. We'll always be thankful for Jane's friendship and mentor ship in the arts. Her encouragement and expertise were a boon to those less experienced. She was among the most unique of our artist pals. We won't forget you, Jane. I miss her very much and shall think of her often when I see her beautiful artwork I have in my home.